The Museum houses the worlds oldest lifeboat The Zetland. Built in 1802 by Henry Greathead as The Original, The Zetland has saved over 500 lives. Other displays include replica fishermens cottage, gallery and local maritime history. The Zetland was a clinker-built, double-ended rowing boat requiring a crew of 13-20 to power her. Crewed by the fishermen and local pilots of Redcar she saw service for some 80 years. 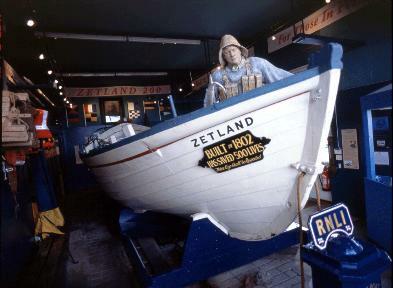 The museum uses lifelike figures and models to bring to life the story of sea rescues on the north east coast. Upstairs is an extensive display of lifesaving equipment, past and present, and a reconstruction of a fisherman’s sitting room. The Laurie Pickett Gallery displays photographs and postcards of old Redcar and her lifeboat crews, highlighting the town’s history as a seaside attraction from Victorian times.